Usually I believe in losing the watch when on vacation. But the usually laid back region of the Yucatan Peninsula is throwing a curve ball at my non-routine. As background, Big L and the Notorious Babs enticed my family to Mexico by luring, would you like to go to Mexico? Instead of going to school and work in the northern part of North America, not including Canada? We are here with my brother Skeeter and his wife the Truly Nice Human, our kids, their kids, and no dogs. Today, we’ve been faced with the dilemma of a happy hour that started at 2 on the Mexican time zone at a place called xpuha. Aside from the fact that this beach sounds like a really productive cough, it has the advantage of being on the Caribbean Sea and having a happy hour that starts at 2. And the bar has swings. 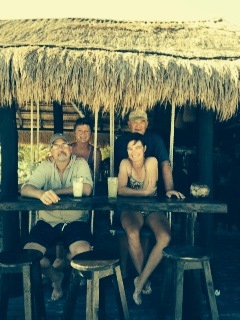 But then we had to rush back to our casa because our main beach bar’s happy hour starts at 5. That bar has swings too. This is totally counter posing my August trip to the accidental Betty Ford Clinic.